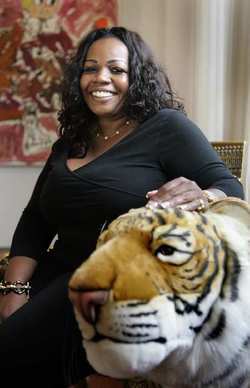 In 2007, Cynthia Stafford won $120 million with her father and older brother. You know all those stories about folks who hit Lotto only to have their lives fall apart? Cynthia Stafford is not one of those people. Where she once gave contributions of, say, $25 or $100 to her favorite arts institutions, she now gives millions. As for her own humanity and insight, well, she proved that long before turning to the humanities -- or winning Lotto. Ten years ago, her younger brother, who was hearing-impaired, died in a tragic car crash, and she took in his five children. "I think about him every day," she told me when we spoke this week. And these days, she's pretty busy. Third Screen: The million dollar question, or in your case the 120 million dollar question, is how did winning all this money change your life? Stafford: My life is pretty much the same. I just have more resources to do what I love to do. I'm involved with the media, and excited about that because it's something I've wanted to do for a while. So, yes, I'm more involved with the arts. But in terms of family, we still do things pretty much the same. I'm pretty down to earth. I like to keep things simple. Third Screen: You are now the executive producer of a major forthcoming film based on Don DeLillo's novel, White Noise, which won the National Book Award in 1985. How did that come about? Stafford: Don Delillo's novel, White Noise, has a strong and really loyal following, and everyone's wanted to see this happen for a long time. The option process was circling for over 20 years before I came along. Don had sort of given up. Another production partner and I secured the option. I'd read the novel. I loved it. I rescued it. Third Screen: You're also on the board of the Geffen Theater, a major locus for the performance arts and studded with famous board members including David Geffen and Steven Spielberg. What's that like? Stafford: I have always supported the Geffen with small contributions. When I decided to get involved after I won the lottery, my personal caveat was that I want arts education, not renovating the seats or putting in new planters. Geffen had already been doing some programs exposing children in LA to arts, through after school programs, for example. I was in a position to further and develop those goals. Third Screen: What started your interest in the arts? Stafford: As a child, I would attend plays and my parents, especially my mom, would take us to museums. She was very much into indoctrinating culture into her children so that was part of my life growing up. Making sure we took in the arts. Third Screen: Why arts education specifically? Stafford: Arts education for children is essential, and I'm disheartened over the fact that funding is continually being taken away from the school system for arts education. It builds our culture. It puts options and ideas and perspective on life into the hands of a community. Without that, you have linear thinking people. I don't think that's great to have in society. Third Screen: Why a million dollars to the Geffen? Stafford: What I really like about the Geffen program is that it's not just for young people, it's also for seniors. We send out transportation to schools and seniors and bring them to the theater. We send educational materials to teachers and then the students come to the play and afterwards, interact with the actors. There were not too many theaters of this kind when I started attending years ago, and I became interested in it. It's great looking. It was recently renovated. It has great energy. Third Screen: Winning this much money is like being cast into a new country in a way. Is it disconcerting? You don't seem ruined. Stafford: I'm a pretty comfortable person. I'm comfortable with myself and with whomever I interact and they're the same with me, and I have a great time. I'm a people person so I love constantly meeting new people. It's wonderful. Third Screen: What's on your slate? Stafford: I'm speaking to a few networks. One of the shows I'm discussing stars me and will be called Fairy Godmother. We're still hammering details out, and the name may change, but it will be a very natural extension of who I am and what I'm doing. Another is tentatively called The Making of a Mogul. And then there's travel, writing, getting the film out there. Third Screen: As your own Fairy Godmother, what's your wish? How do you convey your excitement and love of the arts to others? Stafford: I try to be an example to follow for my kids, and to encourage others to do the same in their lives. Kids need someone to guide, and a parent or guardian is the most natural choice for that. When they see that the parent has any sort of interest in the arts or anything else, it encourages the child. Third Screen: Do you think you'll write a book about that? How to raise an artist? Stafford: I will write book about that. We need to encourage imagination. We need to dream towards our goals and see a bigger picture. I'm about being as child-like as we can. It keeps us creating and manifesting what we want in life and never giving up. I'm like a Peter Pan that way. I constantly encourage my kids to never give up on their dreams, to always believe. Third Screen: What do you say to people who complain that you need to win Lotto to do what you love in life? Stafford: I believe we should never use the word never, and that what you say will manifest in your life. So I say do what I did with my kids. I didn't have the funds to give my kids many of the things they wanted. I would tell them 'we will get it when the time comes.' I transformed the impossible and the difficult in that way. If parents constantly say 'we can't' and 'I don't have,' then they don't open up a space in which to let things grow and develop. So I don't talk that way. Live in a realm of possibility, and enjoy what's available along the way. Third Screen: How is your own story reflected in your projects? Stafford: There's so much white noise around us. We have to tune it out and focus on what matters. My younger brother, Keith Stafford, was a great guy. I miss him dearly, but I have his kids. I have such a great time with them. Jahmil, my 17-year-old, is a terrific sketch artist. He just looks at a person and he can replicate their face on paper. Such great powers of observation! My older one, Charmaine, wants to learn how to open a fashion line. Sigourney, my musical one, is just a talent all around and still having fun figuring it all out. She has a rock band with her brother, Qumani. We have a lot going on but I like to keep my home drama-free. My dad helps out with raising the kids, and we have some help as we need it. I don't want to call winning Lotto a miracle, but what's happened for us is certainly a blessing. Third Screen: You've formed a production company called Queen Nefertari. What does the name signify? Stafford: Queen Nefertari was an important queen in Egyptian history. I feel an affinity for her. A lot of who she was then is about who I hope to be today. She was a peaceful queen who supported the arts. She was mogul in her own right, in her day. I guess we would say she got equal billing with the Pharoah, and that they were the first, or one of the first, couples to bring peace to the planet. She holds a dear place in my heart and in history. She was a leader and yet didn't usurp power. She was a great co-ruler.